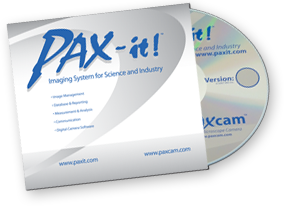 From the 1.4MP PAXcam 1+ to the 32MP PAXcam ARC+, Midwest Information Systems (MIS) offers digital cameras to meet any need, whether it’s industrial or scientific. Imaging software designed around a core of basic functions, with multiple additional modules to cover virtually any imaging related activities for measurement, analysis, archiving, communication, live streaming, extended security and more. The PAXcam Macrostand is an integrated macro workstation with digital camera, boom arm stand, lighting and zoom lens for variable magnification. 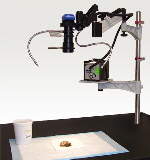 Options include a motorized stage module for an automated macro/micro workstation and a stereomicroscope instead of a zoom lens for microscopic fields of view. 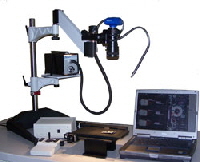 The PAXcam Gross Imaging System is designed to mount directly over the pathology grossing area. Extra-long working distance zoom lens ensures the imaging system doesn’t interfere with specimen grossing. Unique lens handles mean you don’t have to touch the lens to make adjustments for zoom and focus. Basic Measurement: Linear, area, arc, ellipse, angle, calipers and many other functions with reporting features that can be imported into user-defined templates. Image Analysis: Thresholding for auto-detection of objects. User-defined routines may be saved and applied. Network Site License: Run the software with shared components from your server. 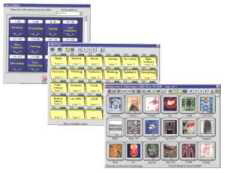 Multiple client workstations can share common image collections and archived files. 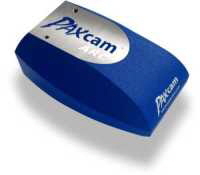 PAXcam Connect Live Streaming Software: Ideal for collaboration and consultation, allows remote viewers to look at your specimen with you in “live” mode. CD/DVD Creator: Burn your imaging projects to read-only media for backup, sharing and offline archiving. Critical Dimension Module: Accurately and repeatedly measure microstructures by setting optical profile parameters and setting “go/no-go” criteria. Ideal for wafer fab and other semiconductor applications. Motorized Stage Module: Drive motorized stage and focus mechanisms in X, Y and Z from within the software. Scripting Module: Create multi-step routines in a scripted workflow that can be started with a single click. Extended Security Module: Lock down your assets for heightened security according to 21CFR Part 11 requirements. Allows digital signatures, validation of assets as unchanged from original versions, and provides audit trails of user activity. Thermal Stage Control: Control Linkam hot stages for temperature ramps and setpoints, and capture images of timed sequences of events. Custom Programming: MIS, Inc. is a software development firm and can assist with custom software to meet your specifications if off-the-shelf products don’t meet your needs.